What is a Wi-Fi Hotspot or Access Point and How Do I Use It? What is a Wi-Fi Hotspot and How Do I Use It? Detailed explanation covering what does Wi-Fi mean? And how to use a Wi-Fi hotspot. I suppose by now everyone has seen different businesses and coffee joints offering “FREE WI-FI Hotspot!“ I guess that’s why I was surprised when a friend recently asked me “What is Wi-Fi? ” Well, the “Wi” Means Wireless and the “Fi” means… Um… Good question! So, WI-FI (or WiFi) as it turns out isn’t an abbreviation or short term lingo for anything. When the technology was originally invented by “The Wi-Fi Alliance” (more geeks), they decided “Wi-Fi” sounded better than IEEE 801.11, so that’s what they picked. They also thought it was catchy and sounded a bit like the well known Hi-Fi technology. Thus, Wi-Fi was born! Wi-Fi is used just like a regular network connection, except without the wires. Most often (but not always) it’s used to connect a computer to a high-speed internet connection either inside your home or at a Wi-Fi Hotspot. And what is a Wi-Fi Hotspot? A Wi-Fi Hotspot is just the term used to describe an area or business (coffee shop, bus, etc.) that has a range that is receptive to a wireless broadcasting device, typically called a Wireless Router. You can set up your own at home quickly by purchasing a wireless capable router and following its setup instructions. However generally if you subscribe to a High-Speed Internet service, the Modem/Router/Switch they provide usually has Wi-Fi built-in so be sure to verify this before you go out and waste some cash. If for some reason, however, your ISP is cheap and didn’t provide a Wi-Fi Capable device when they hooked up your service, you may want to purchase one. 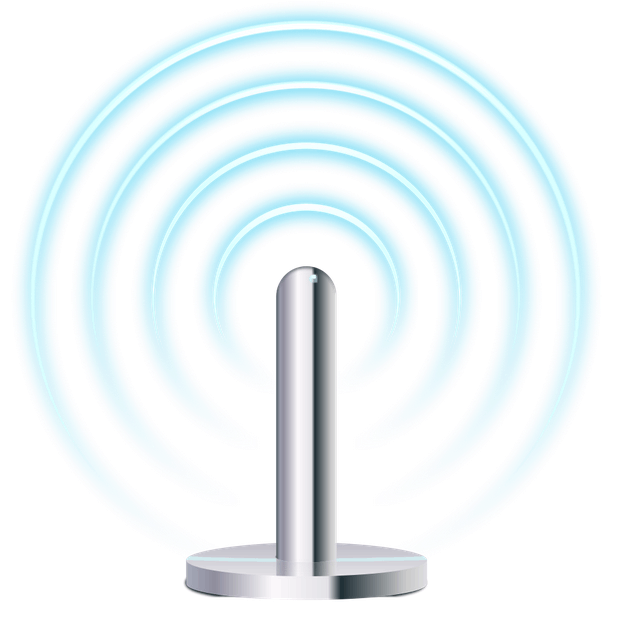 When shopping for one, it’s important to note that Wireless N (or 802.11 N) offers the most range, speed, and stability at the time of my writing this article. Not all devices are compatible with N so G (802.11 G) is another good alternative. How do I use Wi-Fi? Before you can access a Wi-Fi network, you will need a wireless network card/chip. Most new Laptops, Notebooks, Mobile Computers (what are they called nowadays????) and pocket devices (Mobile Phones, iPhones, even the Nintendo Wii) include a built-in wireless chip. You can also buy a wireless card or USB device and plug it into your device. Wi-Fi is common these days, so there are a “Lot” of options. Next, you need to find a public Wi-Fi hotspot (an unprotected wireless network broadcasted over short-distance Wi-Fi radio.) Once you’re in such a range, you should easily be able to connect to it as most modern devices will alert you that a WiFi network is available. You can also connect to a private or secure hotspot (WEP, High SpeedWPA, WPA2), but that will require you knowing the proper keys/password. Is a WiFi Network Safe? Before connecting to any network, you should know the risks and advantages of doing so. Typically, with most unprotected networks, it goes like this. Virus Attack/Device Hacking – Depending on the configuration of your Mobile device/PC, other people might be able to attack your device while it’s connected to the Wi-Fi. Data Theft – Unencrypted data such as surfing your GMAIL account is up for heist as it’s being transmitted back and forth between the Wi-Fi Network and on the Wi-Fi Network. Account Theft – Webmail, MySpace, YouTube, FaceBook, etc., and other login information can be stolen by other people on the network if it’s not encrypted. I recommend using a VPN provider at all times while connected to a public Wi-Fi hotspot. PrivateInternetAccess is my absolute favorite VPN provider. It works on all platforms and is very secure and inexpensive if you buy the annual plan. How about a groovy Wi-Fi How-To? 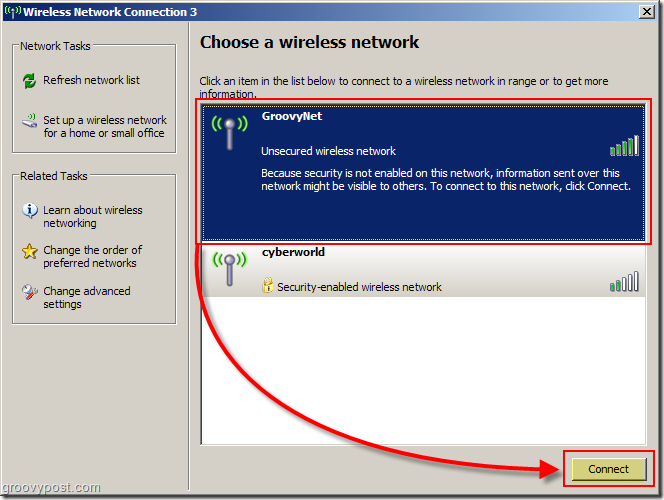 A new window will appear; on this screen, you will be able to select a wireless network to connect to. Typically a business will name their network or SSID after its company. Personally, I would connect to whichever network has the greenest bars as that shows a strong connection. Enjoy the Groovy Wi-Fi, and if you are still having trouble connecting, feel free to post your questions in our free Community Tech Support Forum. Funny! I never actually knew what WIFI meant :) I figured it was wireless something…. Nice bit of history. I agree with your security concerns. I don’t do anything important from a public wifi. I don’t care about the DATA, but I do get worried about credential harvesting. @Jay – Thanks for the feedback & Welcome to groovyPost! I did all this and still can’t get it to hook up-I also have set up a dialup connection on my laptop-I am waiting now for my usb modem to arrive for the lap top-it didn’t have a modem built in. Will the dialup configeration interfer in any way with the wifi connection? Or did a weak signal have anything to do with it not wanting to connect ? @Linda – No. The dial-up should not interfere with the WIFI connection at all. And yes, a weak signal can significantly impact the ability of your laptop from connecting. What I have done in the past is disable my wifi adapter then re-enable it. At times I’ve found this helps me out. @Thomas J, Thank you! Glad it helped out. Thank you for clearing this up for me. I have a laptop but was always afraid to use it outside of my home. This is a big help to me :) Look forward to your great tips always! Thanks for the knowledge I just jumped from the prehistoric hi-fi world to the wi-fi world now all I need to figure out is how to get my music from my 8 tracks to my lap top! FOR REAL!!!!! You guys are awesome, found you on Yahoo. Just had to let you know that you are awesome for sharing this. Good discussion on the subject. The reason I’m here is because I was looking at two competing Androids. One said “WiFi Hotspot” in the list of features, the other just said “WiFi.” Is there a difference? hello!,I really like your writing so so much! share we keep up a correspondence extra approximately your post on AOL? I need an expert on this house to unravel my problem. Maybe that is you! Looking forward to see you. outside my house to use it. How can I find out who it is and then get rid of it?